Hethersett Birdlife is a site for anyone interested in the wild birds and other nature in and around the Hethersett area of Norfolk and occasionally beyond. There are various pages accessed by the menu including local walks, book guides and bird related links to other sites. There is a sightings blog providing regular illustrated updates of the local bird life throughout the year. For up to the minute sightings then check out and follow the Hethersett Birds Twitter Feed. This site also hosts the online copy of ‘Wild about Hethersett’ which is a fascinating read for old and young. 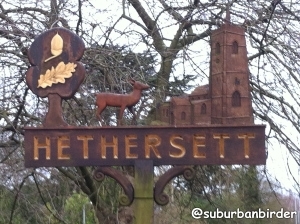 Hethersett is a growing village surrounded by fields woods and a couple of lakes so whilst not hugely diverse in terms of habitat it has something to attract residential and visiting bird life. The slow but steady urbanization of the area is something that will affect the bird and other wildlife and it is hoped that this site is likely to assist with the monitoring of changes in bird population over time. The editor is keen to get any sightings links and historic material as well as images that can be used and if you have anything to add please submit it to suburbanbirder@gmx.com . Sightings of sensitive breeding species and details of nesting sites will not be published and are not requested. If you are interested in a certain bird or place the search the site facility is recommended and can be found in the left-hand side of the site on a computer and at the foot of this page if you are using a mobile device. Thanks for all the information about Hethersett birds. You live in a great part of the UK for birding. I have been on a birding hol there run by Chris Knightley – if I remember the name correctly? Thanks. There are a number of great guides locally. One day I may test them all and produce a guide to the guides. I love birds and look forward to your posts. Any chance of organising a wildlife walk around Ladybelt Park – I walk it very regularly but you are obviously a better photographer! Autumn is a good time of the year. I would be happy to organise a walk but would need to wait a few weeks which would give the winter thrushes and other migrants a chance to arrive. I would ideally like to call on a plant and insect expert to give the walk maximum appeal. email me at the blog email if you or anyone you know may be interested in such an event .